fer Quirarte blog: The jewelry opened the doors to a new world of possibilities. The jewelry opened the doors to a new world of possibilities. Fernando Quirarte sculptor, interior designer, photographer, designer, cartoonist and now jeweler. The artist presented successfully his first collection of jewelry "Paloma". A collection inspired by one of the most symbolic animals of Western culture and characteristic element of the historic center of Guadalajara. "The dove represents a lot. It has been used as a symbol of peace. In the Catholic religion as The Holy Spirit. The pigeons were used as carriers of messages. The pigeon carries a message like jewelry. We can convey love, commitment, friendship through jewelry, "says Quirarte. "I decided to use them as part of my speech because, because they are there. I define them as the murmur of the city. They talk at the same time, but each has its own voice. We share the same floor, we share Guadalajara ". The city of Guadalajara is fundamental to the concept of "Paloma". Fernando Quirarte reinterprets one of the most distinctive elements of the historic center of the city: its mosaics squared red and white. "Probing the mosaic of Guadalajara with a reinterpretation on another scale, portable, glare and reflections is amazing. Mosaic is something that has been there all my life and see it with my eyes have it already gives another sense. Now, if we add the movement of the birds flitting and occasionally walk is what closes the story, "he explains. Fernando defines his first experience in the jewelry as "something magical" that "opened the door to a new world of possibilities": creating portable sculptures. "For me it was important that the result reflects that was born as an object and not started from a drawing which is then translated in three dimensions. I chose to work with models made of paper with origami-like folds and then take it to silver. The opportunity to work with models from the beginning was something that I enjoyed, a game, "he says. With this combination of elements, "Paloma" is a collection clean and smooth, level of movement and balance. 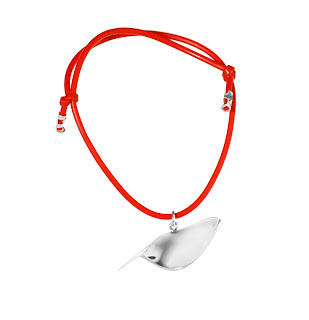 With very wearable jewelry with great simplicity that reveals all the splendor of silver accompanied by the right amount of color. Each piece is sober and honest, right down to the smallest detail. "I designed a pigeon felt replicating the design of jewelry that serves as a container for small parts. I took great care to detail. I think the result was clean and sober, "he says. "I think the main challenge (at the time of design) is honesty. That design reflects why and wherefore was created. When we start to complicate it with noise it shows in the result. An honest design transmit the spirit of the designer. " - Pigeons are associated with serenity, joy, peace and reconciliation. - Since pigeons are paired for life, his image is ideal symbol for marriage, fidelity and loyalty. - One superstition says that if a couple sees doves on their wedding day will be happily married.